Hi! I m Ana and I love this site. Thank you everybody for your printables! I hope you like mine! EASY BUT USEFUL. 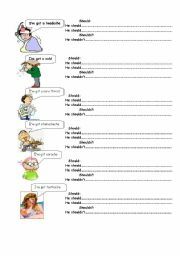 OUR PUPILS HAVE TO WRITE "I LIKE" OR "I DON´T LIKE" WITH SOME FOODS. 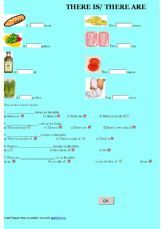 vocabulary(illness and some advices), several exercises. 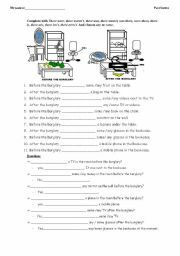 Reflexive pronouns. 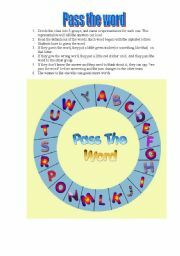 it´s based on the spanish TV programme "Pasapalabra", teacher defines different words and pupils have to guess the words. It´s a funny game and they will learn or practise vocabulary. 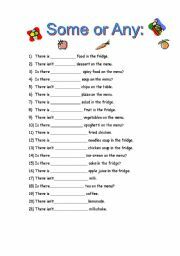 Sentences with there is/ are in afirmative, negative and interrogative. Pupils have to choose "some" or "any" in the gaps. 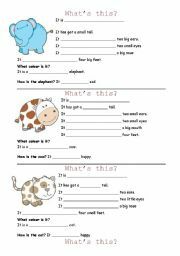 simple worksheet. 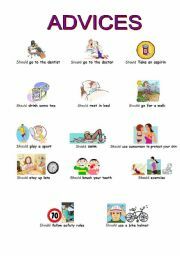 Complete with "can" or can´t and one of these verbs.Useful for our youngest pupils! 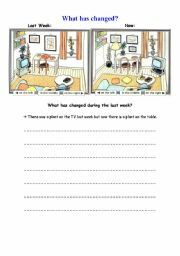 PUPILS HAVE TO COMPLETE THE SENTENCES USING THE CORRECT FORM OF THE VERB TO BE OR THE VERB TO HAVE GOT. 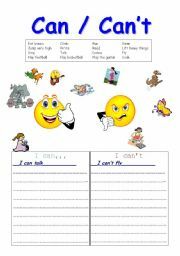 these worksheets are useful to practise" it has got", body parts, "big and small" and colours. Pupils have to fill in the gaps. It´s easy for the youngest! enjoy it! Complete with there was/were, etc. and choose some or any. There was a burglary, what things changed in this room after the burglary? answer some questions. there is/there are with: a bottle of, pieces of, slices of, etc.